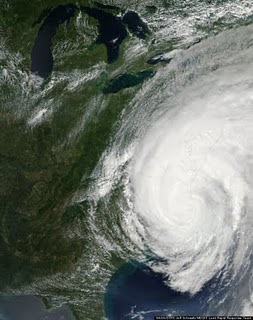 NASA image showing Irene along the east coast. Since our last post, Hurricane Irene raced up the East Coast leaving a path of destruction in her wake. We prepared for the hurricane by hauling our smaller research boats and moving the Nereid (our primary research vessel, here's a photo) to safe harbor. We stored all our loose furniture in the back yard, removed the VHF antenna from our house and made sure we had a good supply of bad movies and popcorn. Irene spared downeast Maine while other parts of the East Coast and New England suffered extreme damage. Despite the approaching storm we managed to get a half day on the water on the 27th. 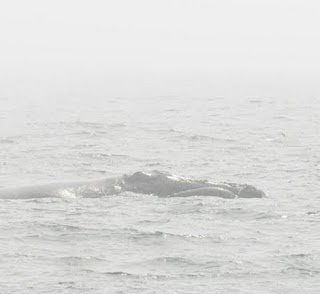 Patchy fog limited our day and made working a challenge, as we could often hear right whale exhalations but not see them. We found (with the help of a few whale watching vessels) a small patch of right whales and worked a few hours before heading home and making preparations for Irene. Working in fog can be a challenge when attempting to get good ID photos.